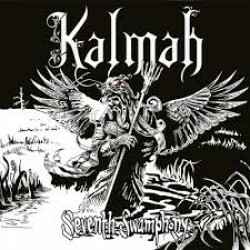 Finnish melodic death metal band Kalmah have returned with their 7th studio album, the appropriately titled, yet tongue twisting Seventh Swamphony. It has been over 15 years since the band first emerged from the Swamp and they are truly one of the few bands within the genre that have been for the most part extremely consistent with their releases, much like their Swedish counterparts in Amon Amarth the band has largely shied away from changing their overall sound too much since their inception, instead of relying on churning out consist slabs of quality melodic death metal, tinged with a touch of black metal ferocity and folk influence. The raging title track “Seventh Swampony” opens up the disc in extreme synth dominating fashion, it has all the hallmarks of classic Kalmah tracks, but with perhaps a much bigger keyboard presence than can be found on previous releases. New keyboardist Veli-Matti Kananen has clearly left his mark on the release and I’m sure will easily win over any fans in the band that had any doubts in his ability. Not to be outdone at all, the riffs on this track are truly memorable and contain some large fist pumping moments along with a huge and super catchy chorus. The band continues to impress with the jaunty, anthem in waiting ‘Deadfall’ along with the folk infused extremity of ‘Pikemaster’, but it is on the folky, mid-tempo ‘Hollo’ where it all really comes together. The track has been masterfully composed, and is a journey with in itself, from the slow burning Amon Amarth like opening passages, to the haunting mono-tone Mark Lanegan esque verses, group choruses and the engaging melodic leads. This song has it all and is a clear highlight on the album. The second half of the album is perhaps not as strong as the first, but still has its truly outstanding moments such as the melodic, synth heavy ‘Wolves on the Throne’ and the slow burning, Amorphis like closing track ‘The Trapper’, which offers a pleasant change in pace and vibe to round out the album. The production from the one and only Jens Bogren, deserves a special mention also, as it is simply amazing. The tones and sound he achieves with every instrument, including the vocals are all spot on, a true master class in production techniques. Innovation is a funny thing; some bands have made a career out of sticking to the same tried and tested formula, while others have fallen on their own sword by not expanding on their sound from album to album. Thankfully Kalmah fall in to the former category and have released another album, largely lacking in musical progression, but really if the band continues to release albums of this kind of quality, in the end does that really matter?